In 1955, the government of the day reformed the Royal Observer Corps (ROC) who had been stood down after the war. Their WWII job had been to spot and identify incoming enemy aircraft. Their new job was to staff nuclear bomb monitoring posts. At first these monitoring posts were above ground but, in time, underground rooms were constructed. Three ROC members would have staffed an underground monitoring post. They would have gone there if the threat of nuclear attack had become significant. Their task was to take measurements of the scale of the nuclear bomb blast and its resultant fallout over a period of up to three weeks after the attack. This information was telephoned or radioed back to a regional headquarters on a routine basis and went on to a national centre in order that the location and extent of blast and fallout nationally could be managed. The Heritage Trust of Lincolnshire was offered an intact bunker near Holbeach in south Lincolnshire and agreed to take it in order to preserve it for future generations. It was largely empty when we took it on but over the years we have obtained most of the equipment that would have been found in there. We maintain the site on a routine basis, although that is usually limited to repairing the fencing and cutting the grass which covers it. 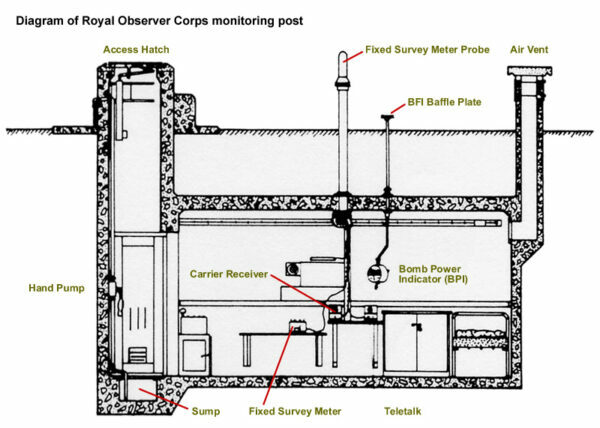 Find out more about the history of the Royal Observer Corps and the Holbeach monitoring post in this video presented by its ex-chief observer Frank Sauntson. You can take a look around the monitoring post in this video presented by ex-observer John Kinder. The bunker is open to the public on a number of occasions throughout the year such as during the annual Heritage Open Days in September. Groups wishing to arrange a tour outside of these times can contact us to find out more. There are no toilet or refreshment facilities on the site.